Dorie tells the story that when you ask a French man about his favorite foods he will always mention his mother's soup, most likely her lentil soup. Italians feel the same way about lentil soup. As soon as the weather gets a little chilly a pot of lentils goes on the stove and stays there until summer. This recipe is a little tres chic as far as lentil soup goes. Dorie adds the warming flavor of ginger and the bright taste of orange. She also throws in some peppercorn and coriander seeds. I especially enjoyed the aroma of the orange peels simmering in the soup. When it is cold and dreary outside any scent of summer lifts my spirits. My family's criticism of the soup had nothing to do with it's flavor. We just felt that it didn't need to be pureed. My daughter kept complaining that lentil skins were sticking in her teeth. I didn't see why I need to use whole pepper and coriander seeds because, of course, they didn't puree either... and they somehow ended up ALL in my bowl of soup. Would I make this soup again, absolutely... we eat so much lentil soup over the Fall and Winter that I am happy to add Dorie's version to my repertoire. 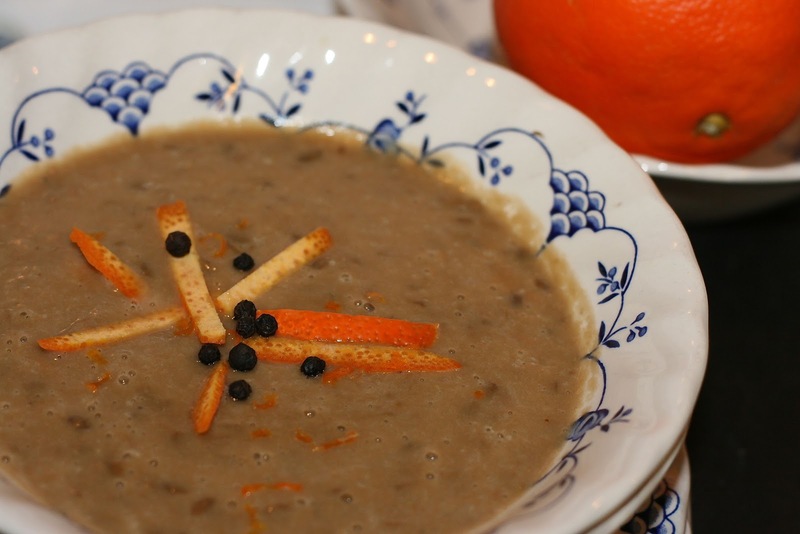 We love lentil soup, and I'm going to try to add ginger and orange flavors! add the cardamon and pepper too. It all works well together. Your garnish is gorgeous, Diane! And I agree...the nonpureed version was my favorite! I liked this one puréed but have seen a few that were left as is and they are pretty too! Wondered about the whole peppercorns and coriander seeds myself but apparently my immersion blended got them! I didn´t puree it, and it was perfect, I agree. But I also found some whole seeds along the way! Wonderful presentation Diane! Have a great weekend. Thanks so much Paula... yes I am not going to puree those lovely beans next time. I think one of the nice things about this soup is that you can play with it a little to get it to suit your tastes. It worked nicely for us pureed (my husband doesn't like whole lentils, apparently), but I can see how the texture could be unappealing. I think the flavor was the winner in this dish - so good! I love the way yours looks with that orange zest on top, it's such a nice pop of color! Thanks, the flavor really was wonderful... but the puree did make it look a little unappeal.. thus the inspiration to put the orange peels in the presentation. What I like best about your food posts, Diane, is that your kids really get into critiquing your meals. And, they don't "glam" it up for their mother's benefit. Lentil skins "sticking in her teeth" à la your daughter was not a particularly pleasant mental picture but very appropriate and a good reason not to puree! Yes, this was a little chi chi for the common folk and your gorgeous garnish made it even more so, but wasn't it delicious and your garnish made an oh-so-pretty picture. Thanks Mary... yes, sometimes I wonder if I'm going to get "chopped" by kids. They watch way too many food contest shows, but their criticisms are usually valid, and I am better cook because of it. I have to agree about the lentil skins. They bothered me, too. We liked it, but did not love it. Yours looks good! My daughter will be happy to hear that she is not alone. Funny how all those little peppercorns and coriander didn’t puree…and they all seemed to wind up in my bowl, too! Your soup looks delicious! I am very impressed that your kids eat so many different types of food, Diane!! A very grown up palette! Have a great weekend! My husband has always baked with the kids and I have always cooked with them... I think their involvement in making meals has made them more willing to eat different things, also I always ignore, "I don't like this or that." I would say, "OK, don't eat it", but I would keep putting it on their plate and surprise... a few tries away they forget they don't like something and eat it. Funny, how that is. I used ground peppercorns ground corriander seeds (because that's what I had) but I did fish out the clove and some of the ginger before pureeing the soup. I agree with your daughter - it probably would have looked better unblended, but the flavor was great. Because I'm not going to puree next time. I'm going to use all ground spices and zest the orange. Loved the flavor. We didn't find any of the spices left whole in our bowls - I guess we got lucky! You did a good job adding color to the photo of your soup. Thanks, I have been trying to improve my photography and this soup was a serious challenge. Oh, Kris seriously go for the crab cakes... hands down the best recipe I've ever made. There are pieces of apple in it... genius combination of ingredients and the sauce would be fantastic on any fish. The soup did smell wonderful as it cooked. My family has lentil soup alot during the winter months. It is one of our favorites. I am glad ou enjoyed this recipe - we did too. I believe next time I will used ground spices. Absolutely, ground spices... oh the taste of a whole peppercorn is awful. them when we were in France and they are so good. Your soup looks delicious and I'm glad it was a hit in your house. Have a great weekend. I have never searched out du puy lentils before belonging to this book group but I really do enjoy them too. Lentils du Puy are my favorite (I use them all the time), though this soup wasn't. I got all the whole seeds in my bowl too. I am looking forward to trying some of your other lentil recipes as I do love lentils. There is an earthy balance about lentils. That is hard to put into words and if you get it. You get it. LOL... yes very random seasoning. Well, I think we are all more aware of spices in soup thanks to this recipe. Ha, ha. Fortunately, the spices seemed to have processed when I put them in the blender - although, I think if I made this soup again I would either pre-grind the spices or wrap the spices in cheesecloth for easy removal. 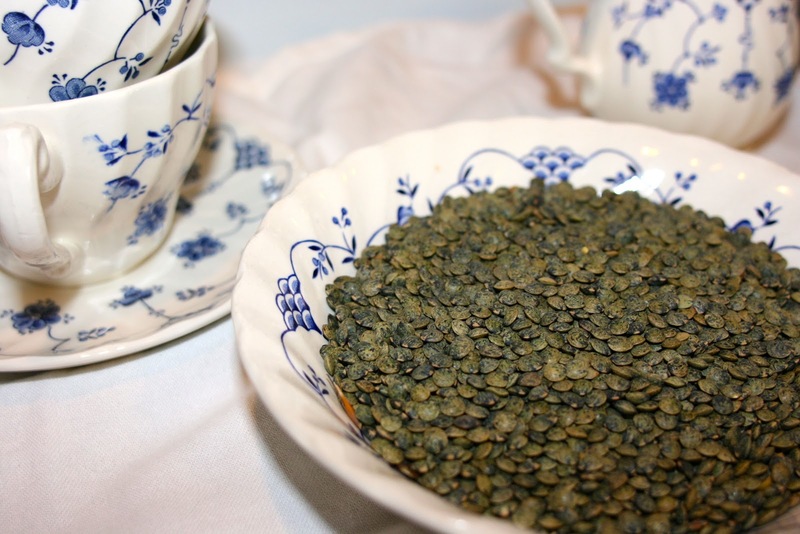 It is funny how many people have lentil memories - up until about three or four years ago, I don't think I had ever had a lentil... I wonder what rock I grew up under? I think it depends on your cultural background. Lentils are big part of the Mediterranean and Indian diet. It's so nice to hear I wasn't the only one! The flavor combination was nice but I really wish I hadn't pureed this. Every time I make lentil soup I wish I made it more often. Maybe I'll start next winter. Yes, Jora we seem to be on the same page with a lot of Dorie's recipes... glad to have a partner in crime.